Reading Time: 6 minutes Design thinking started as a human-centric framework for problem solving, focusing not on single objects but on systems instead: the single object and it's context of use as well the user. In this sense design is more than look-n-feel. Steve Jobs phrased it in his own extreme consequence: "Design is how it works.". This attitude leads to Design Thinking as modern form of product design. When we hear the notion "Design Thinking" the first time, in our mind associations to design with a small d, to aesthetics, might pop up immediately. Probably we would say "Yeah, - design thinking - it's an about making things more beautiful, more admirable and desirable." – And at the first stance, we would be right. At the beginning, thinking about design was used to make things more pretty, to improve the looking and feeling. But, there is a crucial point. Design focuses on single objects. Improving a teapot to make it more pretty has not necessarily a high impact. 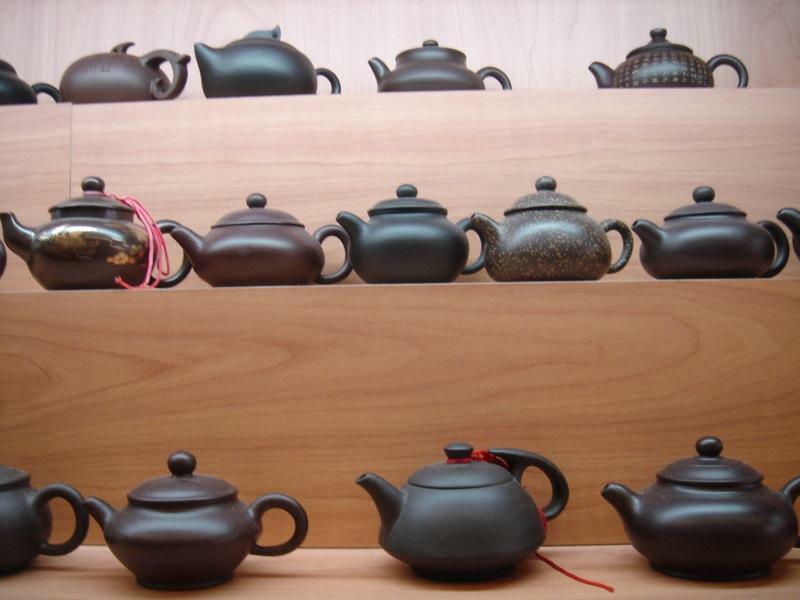 Changing the look of a teapot does not change the world, culture, or society dramatically. The way to heat tea or water isn't affected. 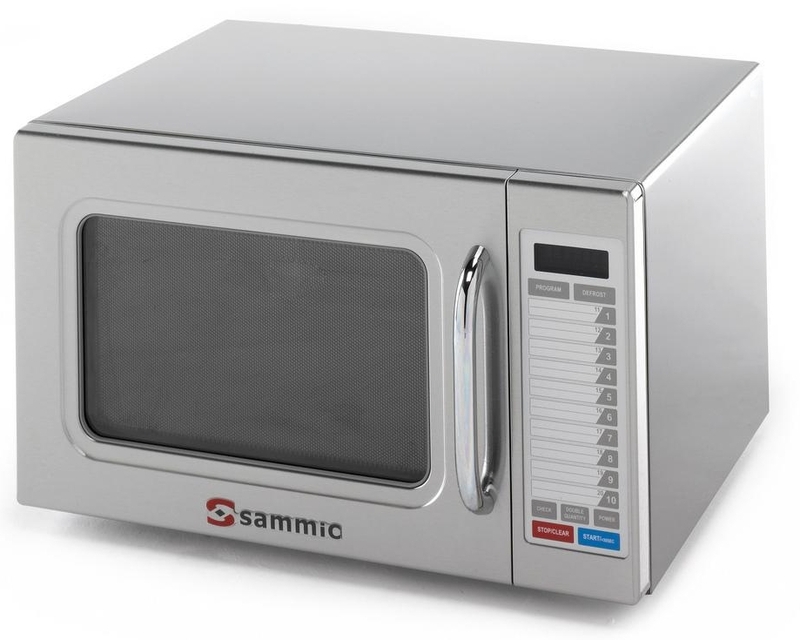 However, replacing the teapot by a microwave oven might have a remarkable impact on culture and society. Design thinking focuses not on single objects but on systems instead: the single object and it's context of use as well the user. In this sense design is more than look-n-feel. As Steve Jobs phrased this in his own extreme consequence: "Design is how it works." — Steve Jobs, Quotes on Design. Design is how it works, (Steve Jobs). –"Form follows function" was an industrial and architectural design maxim starting in 19.th century.2 The maxim became 1919-1933 very prominent in the Bauhaus product design philosophy. It was a kind of battle cry against products overwhelmed with too many adornments and for a dedicated plea for reductionistic design, to use fewer ornaments as possible, and to experiment with new materials and technology. The Bauhaus style was one of the most influential currents in 20.th century modern design, Modernist architecture and art, design and architectural education. Design thinking in its modern understanding came up in 1987 with Peter Rowe's book "Design Thinking". Peter Rowe was from 1992 to 2004 Dean of the Graduate School of Design at Harvard, and chairman of the Urban Planning Design Department, Harvard University. In 1991 the design company IDEO showcased their design process which drew heavily on the Stanford curriculum. 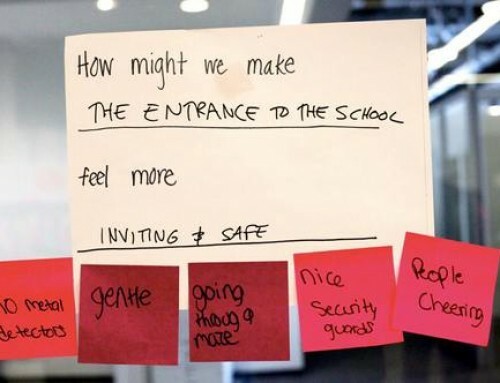 In Feb. 2002 IDEO founder David Kelley gave a now-famous TED talk where he defined design thinking as a human-centered problem-solution approach with empathy as a key characteristic. And, in 2005 Stanford Univ. 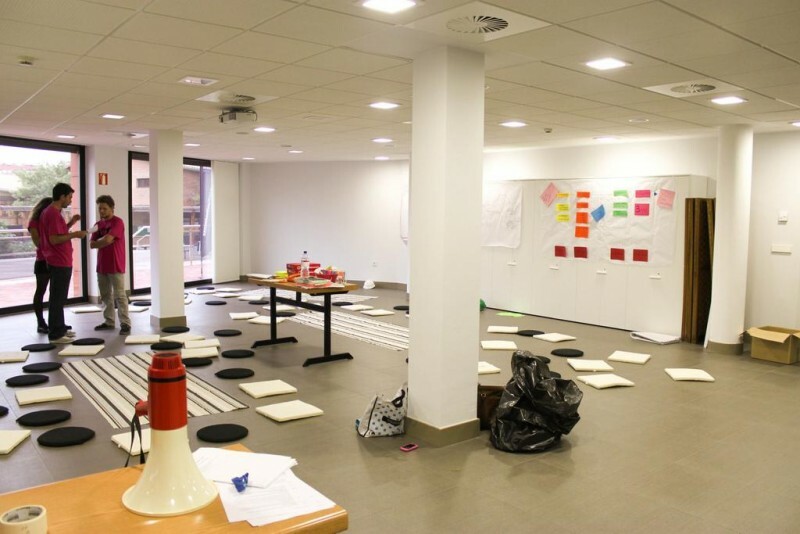 d.school started teaching design thinking as a formal method. Design thinking is an agile ideation method, strongly oriented on the user group’s needs of a potential, new product or service. It’s not about finding problems to existing solutions. It’s about unveiling the real customer needs. "Co-designing products with customers is a better path to success than writing a business plan." "Design thinking is a people-centred, collaborative and action orientated way to understand, reframe and solve problems. It’s less about the look of an item and more about the need that a product or service meets for customers." "Design Thinking is a mindset. Design Thinking is about having an intentional process in order to get new, relevant solutions that create positive impact. It’s human-centered. It’s collaborative. It’s optimistic. It’s experimental." 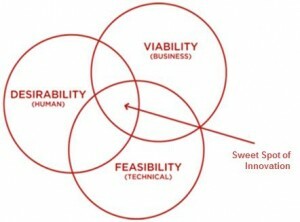 There are three aspects which make product, service or solution design successful: desirability, feasibility, and viability. In design thinking, we balance them properly to find the sweet spot of innovation: their intersection. First, a solution, service, or product must be desirable. It has to fill customer's needs and to fit in their lives. The customers need to want it. Desirability tests whether our innovation solves the right customer problem. Second, to be successful, it is not enough that the product or service is wanted. We must also be able to realize the service resp. the product. The feasibility of our solution is about whether or not we are able to implement it in an effective manner. Feasibility does not only affects our company’s operational capabilities to implement the product or service, but it also impacts the users’ experiences in a direct way. Remember the two sayings: "Be at the right time at the right place" and "Time must be appropriate." This holds especially for new technologies. IBM launched in 1992 the first touchscreen phone, Simon. It flopped. In 1997 Apple released the Newton PDA, a then-revolutionary device that combined a calculator, a calendar, an address book, and a note-taking app. It used a resistive touchscreen to make selections and input text (via early handwriting recognition). the first touchscreen phone. It flopped also. It took 10 years more that the iPhone brought 2007 the success back home. Feasibility tests whether your innovation strengthens your business. Third, the commercial viability of our product or service is the crucial test of whether or not our innovation viable now and in the future. Viability focuses on the value chain of our solution. Does our innovation align with our business goals? Will it contribute to our company's grow? Viability tests your value chain for long-term sustainability. In other words, design thinking brings the designer's view and engineering perspective together by balancing desirability, feasibility, and viability. — Tim Brown CEO, IDEO. "Design thinking is it is in a halfway house between analytical thinking, for the purely deductive and inductive logical thinking that utilizes quantitative methodologies to come to conclusions, and intuitive thinking, knowing without reasoning." Defining innovation as actionable has some benefits. First, it qualifies the ever-important newness with the word value. A product, service or system can be described as innovative. This usually implies a sense of newness, and, in this case, innovative is traditionally thought of as, and used interchangeably with, the word inventive. Second, valuable newness also implicitly recognizes the user of the product as being more important than the producer of the product. The user is closely linked to the notion of value and offers an argument for design methods that embrace people rather than technology. The problem-solving habit in our daily lives and as well as in our business environment is rooted in scientific, engineering, thinking. The value of design thinking is in thinking differently about how to solve business and organisational challenges. : iNNoVaNDiS via flickr.com • Ashley Thredgold via flickr.com • Sammic SL via flickr.com, .